Announced alongside the EOS 750D (known as the Rebel T6i in the US), the EOS 760D (Rebel T6i) is the first model from Canon at this level to feature a top-plate LCD control panel. Like its sibling, however, it shares many of the same features, including a 24.2-Mpix APS-C size CMOS sensor, DIGIC 6 processor, new light meter sensor, and built-in Wi-Fi with NFC. With a native ISO range of 100–12,800 along with expansion to ISO 25,600, the 24.2 APS-C size CMOS sensor is a new model with a greater pixel count than previous generations, up from the 18-Mpix sensor in the EOS 700D (Rebel T5i) and the 20.2-Mpix units in the EOS 70D and flagship EOS 7D Mk II. The EOS 760D also includes Canon’s Hybrid CMOS AF III system that includes the all-cross-type 19-point phase detection AF sensor found in the current EOS 70D, but not the dual-pixel sensor AF technology. Like the EOS 750, it has image sensor-based phase detection pixels to aid contrast-detection AF in live view, and improves on that model with an additional Servo AF mode for tracking moving subjects. However, while this sensor technology isn’t quite as impressive as the 70D’s dual-pixel technology, Canon claims AF performance in live view is similar overall. In addition, the 760D features the new 7560-pixel color-sensitive meter sensor for improved accuracy, and with its sibling 750D is the first in this series to include Wi-Fi with NFC. As for the pull-out 3-inch fully-articulated LCD touchscreen, 5fps continuous shooting, and Full HD/30/25p video, these features can be found on the earlier EOS 700D (T5). However, the 760D has one sought-after control feature that’s been lacking from Canon’s entry-to-mid-level models, and that’s the rear command dial. It’s quite small compared to the equivalent found on the more pro-oriented models, but then Canon claims that this model is targeting enthusiasts. Slightly heavier and larger than its 750D (T6i) sibling, the EOS 760D measures 5.2 x 4.0 x 3.1″ / 13.2 x 10.2 x 7.9 cm and weighs 19.93 oz / 565 g, body only. It is available now at $849 (USD) for the body alone, around $100 over the 750D. With an overall DxOMark score of 70 points, the EOS 760D shows significant improvement over its predecessor, the EOS 700D (T5i), and ranks alongside the similarly-equipped EOS 750D at 71 points, as well as Canon’s pricier EOS 7D Mk II (70 points) and EOS 70D (68 points) models. However, while the sensor performance is generally very good, it is still lagging behind the very best APS-C sensors that (somewhat ironically) are found in this model’s peer group. This includes models such the mirrorless Sony A5100 at 80 points and the A6000 at 82, as well as DSLRs such as the Nikon D5500 — all of which share a similar pixel count with the EOS 760D and are available at competitive prices. Unsurprisingly perhaps, the Canon EOS 760D achieves a score that’s practically identical to this model’s sibling, the slightly more accessibly-priced EOS 750D. The difference of one point is within tolerance and suggests that the two models share the same or similar sensor. Given the similarity in the specifications, generally this isn’t going to be a surprise to anyone. 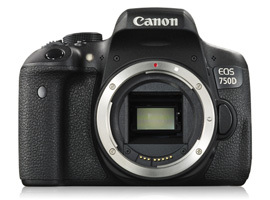 Compared to its predecessor, the EOS 700D (Rebel T5i in the US), the EOS 760 shows a noteworthy increase in performance in each of the metrics, resulting in the 9-point improvement in its overall DxOMark score. Lower noise at base has resulted in an improved color depth score, up from 21.7 bits to 22.6, equating to a +0.25 stop increase in our low-light score, and perhaps more significantly, an increase in dynamic range of +0.8 Evs to 12 stops at base. However, unlike the vast majority of results, the improvement in DR can be seen throughout the ISO range, not just at low ISOs. Like the EOS 750D, the EOS 760D shows a noteworthy improvement in DR throughout the sensitivity range, not just at native ISO. 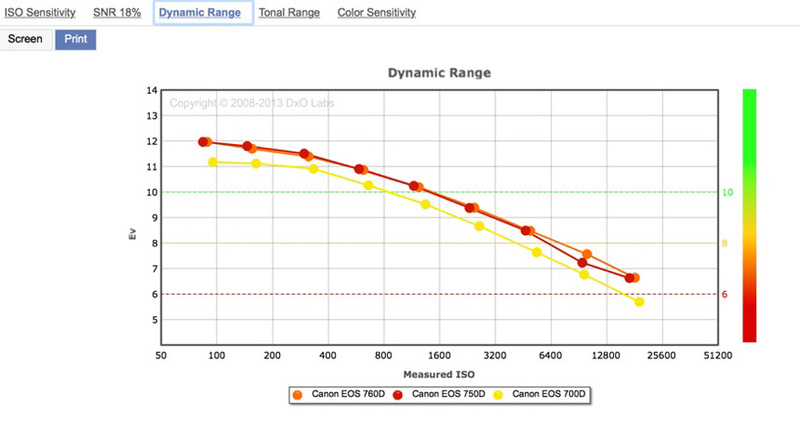 Of course one of the problems facing buyers of the EOS 760D is that it competes with the same rivals as its more accessibly-priced sibling.And although this sensor has lower noise levels at low ISOs than previous iterations, it’s still behind the best in class, which are to be found in this model’s peers, the Nikon D5500 and the Sony A6000. Both models have lower noise levels at low ISOs that result in higher color sensitivity (24.1 vs. 22.6 bits), and a wider dynamic range. While the Sony A6000 can’t match the Nikon D5500’s 14 stops at base for slightly higher low-light ISO scores, they’re still in a league of their own compared to the Canon. At least, that’s that case at low ISOs. At high ISOs (above ISO 1600), the EOS 760 performs competitively for dynamic range, if not in color sensitivity. 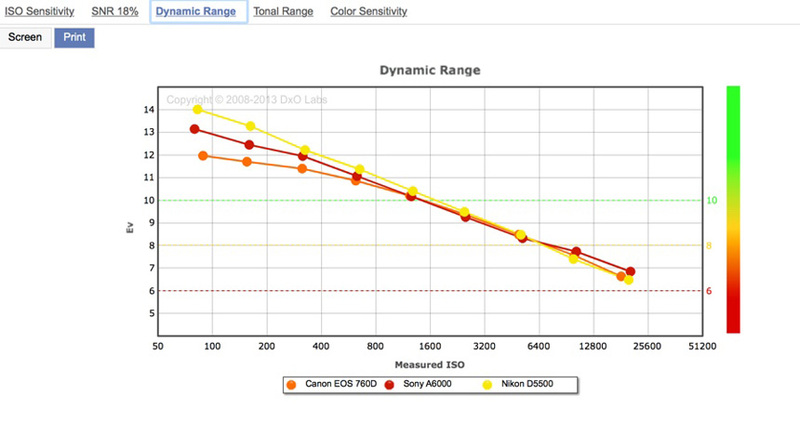 Dynamic range is still well behind the best APS-C size sensors at low ISOs; however, the EOS 760D performs competitively from ISO 1600 onwards. 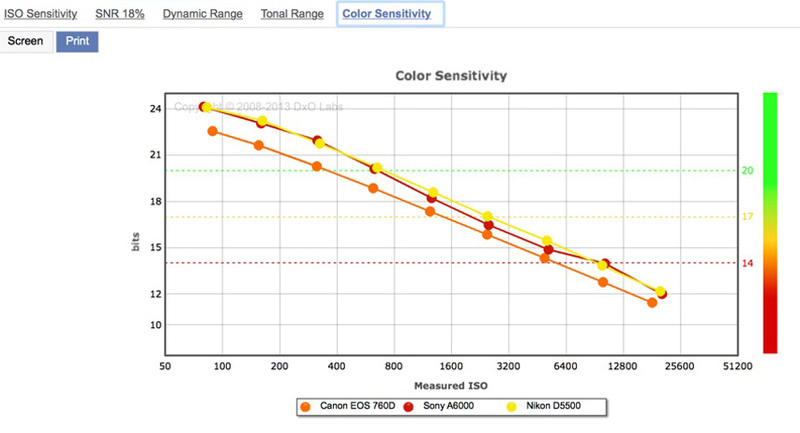 With higher noise levels, particularly at low ISOs, the Canon EOS 760D can’t match the best-in-class APS-C sensors, though the gap narrows at high ISOs. While it’s not our place to discuss why Canon should choose to introduce two models that vary mostly by their controls (although the 760D’s tracking AF capability in live view is likely a worthwhile feature), the sensor performance for the EOS 760D is intriguing. Canon has made significant advances over the previous generation sensor, particularly with regard to low ISO noise levels and improved dynamic range. 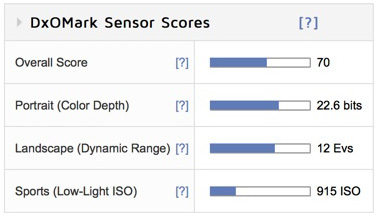 While sensor performance is still behind the very best APS-C models, Canon appears to be taking up the challenge set by Sony, and while it’s still got some way to go, that has to be good news for the consumer.